Strengthens & restores. Free of: sulfates, parabens, phthalates, gluten, drying alcohol and artificial colors. 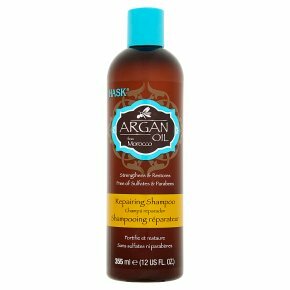 Not tested on animals.Revive and restore the look of your hair with Hask Argan Oil from Morocco Repairing Shampoo. Infused with moisturizing argan oil, this shampoo penetrates the hair shaft, gently cleansing while repairing damage and breakage. Leaves even the most rebellious hair frizz-free, silky-soft and super glossy. Ideal for dry, damaged or color-treated hair. Directions: Apply to wet hair. Massage into a lather, rinse thoroughly and repeat if desired. Ideal for daily use. For best results, use the Hask Argan Oil collection.